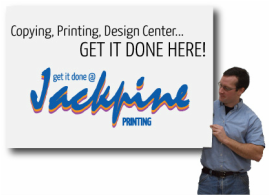 Copy Center - GET IT DONE AT JACKPINE! In our copy center we offer high speed copy services on a Xerox D95, for 65 copies per minute, with auto duplex, collating and stapling. Not sure what paper to print on? Have one of our experienced staff assist you in choosing the correct paper for your project. We have a wide range of white papers with varying weights along with a broad range of colorful neon and pastel papers at our high speed copy center. Quantity discounts and contract pricing available. We also offer full color copies available on a Xerox ImageClass. Quantity discounts available.